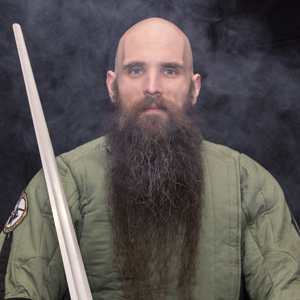 Chuck is the Director of the Longsword Intro Program, as well as the Director of the Fitness & Nutrition team for Broken Plow. He is a certified personal trainer and nutrition coach. He regularly holds fitness seminars and classes, as well as runs the website and Facebook group, HEMA Strong™, with the aim of helping all sword fighters improve their fitness, training, and nutrition. Beware of surprise dad jokes.